Following on the heels of THE DARKANGEL, Aeriel and Irrylath were married but in name only. She was aware something was amiss and, before long, took it upon herself to find out why. A riddle, her staff, the gargoyles and magic accompanied her on another adventure.I fell in love with the author's unusual words, crisp descriptions (especially of food) and the many gray areas of the plot. Each character Aeriel met taught her something about her destiny without her actually aware of it. By the time I finished this story I realized I had to read THE PEARL OF THE SOUL OF THE WORLD as soon as possible. I wanted closure for Aeriel and all of her fellow travellers. I sought a finality to the White Witch. And, most importantly, I desired a happy denouement for Aeriel and Irrylath. The first book is a trial, and the second book is a journey. What always strikes me about this installment is our heroine's transformation into...a prophet, a sorceress, a scientist, take your pick. All her seemingly magical feats are explained so easily to her (and to us) as "help from another" or "not my doing" or "not what I intended." It reminds me of becoming an adult woman--a string of events mostly outside of your control makes you become sought-after, hated, desirable, a prize to control. Aeriel's journey proves that she is still very much a child--a child still in love with her first, most inappropriate crush. The ending of this book always entranced and terrified me. The "Sibyl," the Feasting Stone, the slave markets of Orm...Aeriel's consistent fear of being re=enslaved, of becoming ignorant and passive again, is most telling of her development. She can't articulate that she's free, but she instinctively defends it.I used to feel such smug joy to find that Irrylath traveled halfway around the world to apologize for, essentially, not loving her back. But as an adult I can see that his journey mirrors hers, just tragically out of sync. When they meet again, it is still as two strangers who would chase the idea of each other to hell and back but still, painfully, have nothing to say to each other. please god, let girls stop reading stephanie meyers & read this series instead! This review is for A Gathering of Gargoyles and The Pearl of the Soul of the World…Some might think that the Darkangel Trilogy is in the paranormal genre because of the vampires, but it isn’t. It is mostly fantasy and even a little sci-fi. Pierce creates worlds, new species, and terminology. The cover quote describes the books as Heart-warming and Heart-breaking and it truly is. Aeriel is a good heroine who follows the path of self discovery. She learns that to do great things it requires sacrifice. Nothing comes easy. Anything worth having is worth working for. I love that message. The other main characters Prince Irrylath and Erin are very relatable. At first, Prince Irrylath seems uncaring and indifferent towards Aeriel. Aeriel even calls him her “husband in name only.” Through the battle and eventual victory over the White Witch, Aeriel realizes that Irrylath does love her. Erin is a dark girl from Bern who Aeriel saves from a Darkangel. She is the truest friend anyone could ever have. Some of the secondary characters did not come off the page well. I was hoping to feel more for Ravenna and the White Witch. My biggest criticism is that Pierce uses words that do not exist in the English language. If they do exist there is not modern meaning and not in the dictionary. I understand a new vocabulary is part of the “world creator” mentality, but it irks me to not know words on a page. Pierce also uses a couple different names for the Darkangels (vampire, icari, birdman) and the White Witch (lorelei, oriencon, sorceress). It just gets confusing. Anyway, when you’re reading this prepare to concentrate. Overall, I think this is a good read. It will exercise your imagination and take you away if you let it. Very creative. Enjoyable. I found this book to be less interesting and enjoyable than the first and third of the trilogy, but still good. I was somewhat irked by how predictable several of the supposed "twists" were. Parts of the story lagged a bit too, and the book didn't have the same fairy tale feel as the first book. Certain parts were really neat though, like the dust shrimp and it's metamorphosis later in the story. This is the second book in the DarkAngel trilogy. If you liked the first book you will like this book. More happens in this book and it is just as creative as the first one. You definitely need to read the first book before reading this book though.In this book Aeriel is living in the palace with her Prince, Irrylath and his family; the problem is Irrylath cannot stand to be around Aeriel because he is forced to be in love with the evil water witch. When the second part of the rime/prophecy is revealed to Ariel she is forced to go on a journey to make sure the prophecy will be fulfilled and to save Irrylath from the water witch.The tone of this book is similar to the first book. Aeriel very much goes with the flow. She is an interesting character in that she does not seek out action, the action comes to her. Yet, she shows admirable strength in dealing with whatever hand is dealt to her. This book is a bit more of an adventure/quest than the first one was. Aeriel does a bit less waiting around; but there is some inconsistent pacing. Again Pierce has Aeriel go through a lot of action, then times passes as Aeriel waits, then action, then more waiting.The storyline is very fairy-tale-like and very creative. The writing is beautiful and descriptive; at times you feel as if you are floating through the story. It was a beautiful book and a great continuation of this story. While the main story point was resolved, the major storyline remains to be resolved in the third book. I am looking forward to reading the third book as soon as I can. I thought this book was more enjoyable than the first. I love books that take you on a journey with the characters, and a Gathering of Gargoyles did not disappoint. Granted I worked out a lot of the rhyme before Aeriel did, but I liked that, it made me realise I understood and actually loved the book. The gargoyles were adorable, although I never even considered them to be the lons until the lyoness nudged Aeriel in that direction. It was an amazing book that I look forward to reading again and again, it is one I will not tire off. The Pearl of the Soul of the World is next I just hope that it doesn't disappoint. Originally reviewed on The Book SmugglersAfter cutting out her own heart and giving it to the darkangel Irrylath, Aeriel has not only found a way to save her world from the clutches of the White Witch and her seven icari, but she has also found a way to save Irrylath's soul. After breaking the curse on her new bridegroom, Aeriel and Irrylath make their way to Isternes, the childhood home of Irrylath, before he was treacherously traded away to the White Witch by his nursemaid Dirna for life and power. Here, Irrylath finds his true mother, his brothers, and his birthright as the eldest son and heir to the land - but though he and Aeriel are welcomed with open arms by his Esternese kin, their struggles remain. Irrylath remains plagued by terrible dreams and withdraws from Aeriel's touch and compassion - and Aeriel learns that her husband, in name if not in truth, still is snared by the hook of the White Witch. If she is to save him - and to truly save her world from the Witch, who even now searches for a new babe to make into a darkangel - Aeriel must embark on a dangerous quest, and solve an ancient, hidden riddle.A Gathering of Gargoyles continues the story of a brave young woman named Aeriel, who has inexplicably become the one person that can stand against an evil that threatens to consumer her world. And, dear readers, I loved this book so very much. I must start this review properly by thanking the lovely Megan no h for her emphatic recommendation, because A Gathering of Gargoyles is truly and utterly awesome. It is in fact a better novel than The Darkangel; The Empire Strikes Back to the first novel's Star Wars. I know that science fiction analogy may seem at first blush NOT to make sense with this trilogy, but in actuality it has far more resonance than one might suspect - because A Gathering of Gargoyles makes it abundantly clear that this series is actually one rooted in science fiction. Aeriel's world, as it becomes known in A Gathering of Gargoyles, is actually our moon; a "daymonth" to Aeriel and her fellow creatures, is the equivalent to a lunar day, with the constant companion of the Earth, or "Oceanus" to Aeriel, shining its pale blue light upon the moon's surface. Unlike our current moon, though, Aeriel's world is a place of impossible, fantastical life - in which there are seas of dust hiding moonwhales and serpents, with deserts and forests, gargoyles and lons. This is the most impressive thing about this trilogy, and A Gathering of Gargoyles in particular - the incredible scope of imagination. To be sure, this is a fantasy novel with magical creatures and gifts, but the story never once feels tired or familiar because of the magic of Ms. Pierce's prose and the wildly imaginative setting. Reading A Gathering of Gargoyles is almost like being in a dream - things are strange and ever-shifting, but you never really feel confused or lost, because it is your dream, and impossible things are accepted as a matter of course. From a pure story perspective, the actual plot of the novel is fairly simple - Aeriel leaves Isternes to find the lost lons, so that Irrylath's brothers can ride them into battle against the White Witch - and her journey takes her to the edges of the world. In truth, the story is about Aeriel as she discovers who she is, what she is truly capable of, and how far she will go to stop the Witch and win Irrylath's heart. The riddle - actually more of a prophecy - that sparks her journey lies at the heart of the book, and I love that its meaning changes as Aeriel's self-awareness grows. For all that she is risking everything for Irrylath, this is truly Aeriel's story, and I loved every last second of it. I loved following Aeriel from Isternes, across the Sea-of-Dust, to singing for her sup and on the run from bandits, to the desperate land of Pirs and the terrible truth of its ruler, to eventually back in her own home of Terrain. On each leg of her far journey, Aeriel learns a new truth, gathering Irrylath's former gargoyle guards along the way. My main complaint for The Darkangel was Aeriel's lack of oomph, and her utter, unflinching goodness. While she is still unerringly moral and good in A Gathering of Gargoyles, this book shows us glimpses of her vulnerability. She falls for the tricks of a false king and a hag; she shows her frustration when all her work seems to have gone to waste. And, most touchingly, we feel her heart breaking as she realizes the truth of Irrylath and that he does not love her.This volume ends on a sweet note, with the promise of even more fantastic adventure and peril ahead - the trilogy must close with Aeriel and Irrylath's confrontation of the White Witch, and I cannot wait to find out how it all ends.If you haven't read this gem of a series before, I implore you to find a used copy and start. Absolutely, wholeheartedly recommended, and one of my most cherished finds of the year. Another trilogy I won't bother to finish. Irrylath was far more interesting as a Darkangel than as human Irrylath. Too angsty. Thankfully he isn't around much, only in the first chapter or so and in the last one. We get to know why he can't "love" Aeriel. Not really a mystery, since the specters told Aeriel in the first book (view spoiler)[that he used to be the Witch's lover, who is his adoptive mother... Yikes. (hide spoiler)]Aeriel starts a new adventure, but alas, she is not what she used to be. Or all the other characters, for that matter. Since when all the Gargoyles have names? Since when they love her so much? And everywhere she goes, she finds something useful and powerful.. things that don't look much, but she is all "oh well, I am going to take it", and turns out, they are magical stuff or super expensive stuff that helps her in her way.And not only she is extremely lucky to find those objects; she meets allies that help her out, or otherwise, she would have been dead by chapter 3. She isn't the sharpest girl, the poor thing accepts drinks and food from suspicious people (her uncle, Diurna) without thinking. And what does she get? Drugged, that's what. Not once, but for almost all the length of book.I think that her whole stay in Pirs was such a waste of time. How she did not notice a thing, from the very beginning. How she did not notice the truth about her cloak. 2nd book in the series was a bit boring, tbh. And since I don't care anymore about Aeriel and Irrylath, til here I come. An excellent sequel to The Darkangel and a solid precursor to the third book of the trilogy. We learn some more history of Irrylath's enchantment, bring in a host of new characters, and awarded plenty of riveting plot twists along the way. We get a much broader picture of Aeriel's world in this installment, as she traverses half the nations and encounters different cultures and colorful people. I really enjoyed that aspect of it, and in some ways it had a "fuller" feel than the first book, as if it's expanding on the world we only glimpsed one detailed corner of in the first book. Pierce does a good job of hinting at certain things, giving the reader enough clues to foreshadow that there's something really important about certain events or objects, but without revealing enough to give it away before the time is ripe. It very subtly adds to the suspense and holds the reader's attention without frustrating them. Aeriel is still a solid heroine, well-balanced between human and an unknown variable. I was really impressed with the way the author hints at her "strangeness" without ever really giving away if it's due to some innate power of Aeriel's or merely a result of her circumstances. I thought it was a very unique novel in many respects. Overall, I thought it was an unusually solid second book; it's written as if it's really worth your time as a novel of its own and not just to fill in the middle of a trilogy. Having rescued Irrylath and escaped to his mother's kingdom (his birth mother, not the witch who told him she was his mother), Aeriel is now stuck with a husband who won't even let her touch him and a reluctance to tell anyone the truth about where (or who) Irrylath has been for twenty-four years. When she receives the second part of Ravenna's rhyme, she sets out alone to solve it by finding and restoring the lost guardians ("lons") of the six other realms. The part that I still think is really cool is the revelation about where the lons have been all this time, which isn't obvious. Aeriel's heritage is way more obvious, but at least Pierce doesn't tie the story in knots trying to keep it a secret.On the other hand, I know as a kid I didn't appreciate the final plot complication, when Irrylath finally explains why he can't be close to Aeriel. I'm sure all I noticed was that he finally showed that he *does* care for her. The truth (view spoiler)[that Irrylath was the witch's lover and that he's still aroused by her in his dreams (hide spoiler)] is far more complex and sad; it goes a long way toward making Irrylath more clearly a victim.As with the first book, I admire Pierce's worldbuilding, and I think this is a stronger story. I just don't love it anymore, and that makes me sad. I liked this book better than the first, and I'm looking forward to reading the next book, but it seems like I might be the only reader who doesn't particularly like Aeriel. She just seems so clueless sometimes and some of the things she does make absolutely no sense. It seems like she can barely figure out anything for herself and everyone else is always having to give her the answers. I think the world and story are really interesting, though, and I like the side characters. I'll definitely keep reading to see how it ends and I hope I grow to like Aeriel more during the next book. As a side note, I noticed a lot of typos in this book, just like the first one. I don't know if it's like this in all editions of the book, but it seems like really sloppy editing and it can be a bit distracting at times. I enjoyed the second volume more than the first. The plot is allowed to stretch out more, while still staying interconnected, with no unecessary rambling.Poor Aeriel is still in love with her prince-husband, but he cannot love her back, even though she has literally given him her heart. She really grows into her destined role of hero, though, and by the end of the book she is no longer a timid slave, but a force to be reckoned with. I like that it's not a feeling of destiny that drives her, though, but her feelings of love and affection and hope.I can't wait to get my hands on Volume III. At the end of this volume was a teaser, which was intense. It looks like Aeriel is going to be betrayed. She has to overcome the evil witch, but at what cost? This book doesn't have the charm of Darkangel. It feels more forced and less like a fairytale. The references to other works are enjoyable but constructed. It is a satisfying read, but lacks the mastery that set the first book apart and I would recommend in conjunction with that and not alone. Oh My, this series is seriously addictive. Meredith Ann Pierce, where have you been all my life? I read this novel when it first came out. I loved the beautiful language. Beast became a prince and the not so beautiful heroine became both a beauty and a princess by her own merits and courage. Okay, so I really enjoyed this book. I'll admit that the first half of the book didn't really hook me. only when Aeriel crossed the Sea did it get interesting. I really liked Aerirel's character (though occasionally she would do things that didn't make sense, but I'll get to that later). It was very refreshing to have a female main character who wasn't dependent on a guy, like so many YA girls are these days. She saw the it wouldn't work out with Irrylath and later to go on her quest, though she was still pretty upset about the whole thing. I mean, she got enchanted by/fell in love with Irrylath when he was evil and she married him. Now he's normal and he isn't into her. So she realizes he needs his space (the whole thing with the witch was pretty traumatizing) and she leaves. So I was having real trouble getting past the whole part after she leaves (the Sea of Dust trip and the bits and pieces after that were pretty boring). But then she got to the other side, passed the county where there was all of these bandits, and was on the run from them, and that's where it got interesting for me. You are at the edge of your seat waiting to see what happens next. The plot had a lot more twists and turns then the first book. In fact, I liked this sequel much better than The Darkangel. The pacing was much faster and the whole thing was generally more intense. My only complaint was that sometimes Aeriel did some pretty stupid stuff. When she is at the suzerain's house, Erin gives her every kind of warning that the suzerain is bad news, but Aeriel still hangs out with him. I don't know if Pierce didn't convey how extensively Aeriel was under the hungerspice's spell, but she just felt stupid for staying with him, to me as the reader. Same thing went for went they were escaping the suzerain's house and being chased by a darkangel. He is using Aeriel's shadow to approach their group and Erin and Roshka are lying flat on the ground to minimize their shadows. Roshka is telling Aeriel to get down, but she wasn't, she was just standing there. Was she under the darkangel's spell? It kind of confused me. But whatever, the plot was so good in the second half that I can overlook the few times Aeriel's character acts oddly. I really liked how the author didn't provide the reader with a map (like they do in most adventure stories), yet I am fairly confident that I could draw one myself fairly accurately after reading this book. That's very impressive to me that Pierce gave a clear (more or less) picture of the land they were in. The only other issue I had with this book was how time was kept. The whole magical land seems to be a moon orbiting a planet, Oceanus, and the sun is called Solstar. They have these things called day-months and fortnights. (I have no idea how long these things are, so estimating time within the book is difficult). I know how long a fortnight is with our calendar, but I don't how that translates into the day-months they have. Oh, she's upset because she's been at the suzerain's for two day-months! Ummm...so what does that mean to me? I think that the whole land is best compared to Alaska because days and nights appear to last for more than 12 & 12 hours, depending on the time of year. (In the book there seemed to be very long periods of time where the sun wouldn't rise or set). Well, at least the whole system is something different and I can respect that Pierce tried something new. I still found Aeriel's point of view in the third person to be kind of clod and impersonal (but a lot of adventure stories are like that). It would have been cool if Pierce wrote it in the first person, so we could get to know Aeriel's character a little more and understand her motivations more clearly. Also I really liked the ending. A lot of things came together that I didn't think would until the third book. I loved the bombshell Irrylath told Aeriel at the end about him and the witch. All in all, the book was great, much better than the first in my opinion. Aeriel really steps up as the heroine and the plot is pretty well-paced (I haven't read a good plot like that in a while, so it was nice & reminded me kind of like Percy Jackson, but not as intense). I can't wait to read the next book. Happy St. Patrick's Day! 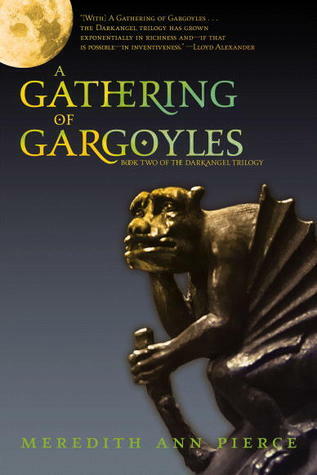 So, exactly one month since I started reading it, I'm finally done with 'A Gathering of Gargoyles'. It shouldn't have taken me nearly so long, and I'll go right ahead here and say that the length of time I took to read it had nothing to do with the book itself. Though not quite as enjoyable in my eyes as 'The Darkangel' was, 'A Gathering of Gargoyles' was still a pretty good book overall. I just had a lot of other stuff going on.In keeping with the last book, a lot of the concepts in this second installment of the Darkangel Trilogy were completely fantastical. The sea of dust, the different races of people having a plethora of different skin colours (ranging from mauve and rose, to honest-to-God-blue), and even the 'lighthouses' all being linked in some mystical way; all these odd and wonderful facets of Aeriel's world are really what make me enjoy the story as much as I do.Contrary to what I expected, there wasn't a whole lot of Irralyth. I have to admit, I was a little disappointed there. I was looking forward to more detail about how he coped after being saved by Aeriel. I wanted to learn more about his time with the White Witch, and how he really felt about the whole thing. Some more interactions between him and Aeriel would have been nice too - she did save him after all. Even some more interactions between Irralyth and his step-brothers or mother would have been welcome; surely there were interesting things there to be explored? But alas... Perhaps the third book will satisfy my curiosity.There was one other tiny thing that bothered me about this book, and I want to quickly mention it before I wrap this review up. The reason this book has only 3 stars (although I would really consider it more a 3.5) is because some of the events in the book were either completely out of left field, or totally, painfully predictable. A lot of the time they were a bizarre mixture of both. Like the whole segment with the suzerain of Pirs. Or, more specifically, the revelation that Aeriel was the princess who was spirited away by the white bird. Putting aside the fact that Roshka obviously looks a lot like Aeriel, and the fact that this maid who saw the princess taken described a bird suspiciously like the messenger heron... Okay, I know it isn't until the very end that we finally know for sure - given that Aeriel was so set on denying it - but can anyone honestly say they didn't see that coming? The second rime even hints at it, and that's way back at the beginning of the book. By the time I read Roshka's story I was convinced, and the fact that Aeriel continued to deny it suggested to me that the reader wasn't really supposed to be as certain as I was. It was a 'surprise' that was very poorly foreshadowed I think. The 'out of left field' part comes in when I wonder to myself if it was really necessary to have Aeriel be a princess. I just seems too convenient. Originally she was a slave, the underdog, someone who was special only because she had to be. Now it feels like she was special from the start, by virtue of her ancestry, and honestly I think I preferred it when she was just a nobody forced to become a somebody.But hey, like I said, it's quite a small thing. It's something I can live with, especially as the series has been written in a very fairytale-esque format. A little of the 'too-coincidental-to-be-real' doesn't hurt the overall story. I really enjoyed the first book in this series, despite some stylistic elements that weren't really my cup of tea. This book carries pretty much more of the same, which is fine. The reason I gave it three stars this time around, however, is a beef I have with the character Aeriel. In this book, she is, for lack of a better word, dumber. And I am not just peeved that the character makes mistakes or misses a vital piece of info that's painfully obvious to the reader (though these are both also true), but it seems like the author deliberately made Aeriel oblivious to things that should have been painfully obvious to ANYONE with half a brain. For example: Aeriel gets a new cloak. And there are seven (I counted) SEVEN times where she specifically puts up her hood, and the people around her - sometimes with whom she is in the middle of a conversation - suddenly cannot see her. No, seriously, they jump up, cry out in consternation, and swivel around looking for her in MID-SENTENCE.Aeriel's response to this? "Huh, that guy is really weird. Whatever, guess I'll just wander off now. "Later, she is both specifically told (and shown) that a man she has met on her travels is not only drugging her but plans to kill her. When her friends say "come, let us run away!" Aeriel's response is, "sure, but first I'm going to go meet with the bad guy, for no apparent reason but to let him know I am on to him!" And when said Bad Guy says "come, follow me into the tower where you already know Bad Things are going to happen," she FOLLOWS him. There are, for the record, no guards, no hostages, the Bad Guy isn't even dragging her along by her arm or threatening her life...she just decides to follow a confirmed Bad Guy to a confirmed Bad Place because Reasons. So, while Aeriel in the first book is just venturing out into a strange, big world and gradually learning confidence and her own inner power and so on, Aeriel in this book just wanders around getting herself into terrible situations with no real character development or further understanding of the world. Whew! Okay, so that's the negative. Here's some positives, because after all, I did still give it three stars. The story itself is still interesting. Lots of typical quest elements, but hey, those are deeply ingrained in society for a reason. And I was interested in seeing how the lons would be rescued, and I did enjoy the end of the book. Ke druhému dílu Temného anděla jsem se dostala až po několika letech, takže mě mile překvapilo, že z toho prvního jsem si pamatovala skoro všechno. A když už mi přeci jenom něco vypadlo, tak jsem si na to prakticky hned zase vzpomněla, protože postavy se naštěstí často zmiňují o tom, co se dělo před tím. Musím říct, že pustit se do téhle knihy pro mě byla příjemná změna. Po všech těch dystopiích, YA knihách nebo urban fantasy, je tohle zase něco trošku jiného. Máme tu úplně jiný svět, se svou vlastní historií, svými kouzly a bájnými ochránci zemí. Tohle mě strašně bavilo - postupně se dozvídat něco víc o vzniku světa a jeho postupném ničení. Taky odhalování minulosti některých postav bylo zajímavé, ačkoli jsem něco z toho dokázala odhadnout. Třeba odkud ve skutečnosti pochází Aeriel nebo temný anděl Irrylath. Aeriel mám jako hlavní postavu moc ráda. Je odvážná, se vším si umí poradit a nemusí jí nikdo neustále zachraňovat zadek. Líbilo se mi, že sebou nenechala zametat a rozhodovala se podle sebe a na podle druhých. Ve většině knih dělá hrdinka všechno proto, aby si jí všímal její miláček, tady je to ale naštěstí jinak. Aeriel sice smutnila, že o ni Irrylath nemá zájem, ale na druhou stranu nikde nebulila a nelezla za ním. Prostě si řekla, že když ji nechce, tak je to jedno, ona měla stejně jiný úkol. Irrylath byl v prvním díle úžasný, tady už to bylo o něco horší. Nejen, že neustále Aeriel přehlížel, ale ještě k tomu se choval jako mučedník. Sice si prošel hroznými věcmi, ale nemusel to Aeriel pořád dávat najevo. To bylo furt jen - čarodějnice má na mě vliv, zničila moji duši, nedokážu nikoho milovat. Tyhle hrdiny litující sami sebe fakt nemusím. I přesto mám ale tuhle sérii hrozně ráda. Připadá mi, že tak nějak zapadla a moc lidí ji nezná, což je škoda, protože je vážně povedená. This books just didn't do as much for me as it's predecessor.The middle 200 pages or so were just dull. This wasn't just a little slow in the middle like the first one, it just stopped. There was not much urgency, just wandering around. The closest they seem to get is being pursued by bandits, but they're never actively threatened by the white witch for most of the book.The other problem is Aeriel. In the first book she's naive; in this book she's dumb as a post. It works in the first book - she's being driven by forces outside herself. Other characters are there to guide her, so he naivete is rather charming. In this book, Aeriel is more or less on her own and seems to miss incredibly obvious "clues." Many people make mention of her suspected heritage, and she plays dumb, or is dumb.Another issue is the mass of coincidences. Often Aeriel picks up something seemingly trivial, then later on in turns out to be incredibly valuable. I can go with this once, but it happens three to four times. That's just getting lazy: have her recognize its worth if she's going to be picking up so many valuable things.That being said, there are really enjoyable aspects to this book. I really enjoyed a lot of the interaction and how they dealt with Aeriel and Irrylath's relationship (view spoiler)[and how they are not just hunky-dory (hide spoiler)]. I also really enjoyed the way things came together in the end. I do love this series! Loved it as an adolescent, and still love it today. It's not perfect - there are bits of archaic phrases where I think Pierce is too self-consciously writing Fantasy with a capital F - but for sheer beauty of imagery it beats out nearly every other fantasy setting I've ever read. The world is so lush and beautiful and imaginative...I also really appreciate the relationship (or lack thereof) between Aerial and Irrylath. So often in fantasy, the rescued princess is the love interest. It's almost taken as read, that she's there as a reward for heroic behaviour. But here the prince is rescued and in this book it becomes clear not only that his captivity has left him with an enormous amount of trauma, but that he is in no way a reward and absolutely refuses to be a love interest. It doesn't matter that she rescues him, it doesn't matter that she returns him to his family. It doesn't even matter that she loves him, because he doesn't love her and that's the end of it. I'm not nearly as interested in Irrylath as I am in, well, any other character, but he's there on his own journey, a person and not a prize, with his own story and his own agency and that is really refreshing to read, even gender-flipped from the usual script as the story is. It seems to follow a rule: The second book in a trilogy is invariably the weakest link, usually there only to bridge the story between the first and third books. I can't say this was 100% true for A Gathering of Gargoyles but I will say, if not the story, then the characters were weaker, especially Aeriel. I don't know what happened, but somehow she became dumber during the book. Despite numerous hints, whether about something as trivial as the cloak she wore or about something as important as her true identity, she had to be beaten upside the head with a sledgehammer before any of these concepts got through to her. And once they did, she had to act in the predictable dumb-heroine manner: “What are you saying? Are you saying what I think you're saying? You're crazy!” Despite that annoyance, the story continued its theme of intertwining various elements from folklore and fairytales, as well as a deeper exploration into the sci-fi background of Aeriel's world, into a lyrical story of transformation, rebirth, and empowerment. Aeriel is on another quest. She and her "husband", Irrylath, have journed to another land to meet his mother. He was stolen from her at age six by the lorelei. They are also trying to restore the lon, who is a pegasus creature, to his mortal life. It's complicated, you would have to read the book to explain it.Aeriel realizes when she is visited by the former "brides" of her husband, when he was becoming a vampire, that she needs to leave him, and find the other lost lons. The lons are protectors that were put on the planet to take care of the people when the creators went away.She will need the help of the lons to overcome the lorelei.This book is very creative. It is a much better read that this review. You have to read it to understand and enjoy the creativity of Meredith Ann Pierce. Leí este libro hace años y tenía tan buen recuerdo de él que este año por fin busqué la primera parte de la trilogía que no había leído por aquel entones.Casi no recordaba nada de la historia, sólo algún detalle tonto, así que la relectura ha sido casi de nuevas.Es de esos libros que cuesta dejar de leer, porque antes de que termine un episodio, ya está comenzando el siguiente. El mundo fantástico en el que se ambienta no se explica cómo es directamente, si no que se van dando pinceladas conforme avanza la historia. ESto hace que pueda haber algo de confusión en algún momento, pero hace la lectura mucha más entretenida.El personaje principal es Aeriel, un personaje femenino fuerte, aunque al principio no lo parezca.Aunque hay algo de romance de fondo, no es para mi gusto lo principal de la historia. Lo principal es la búsqueda, la determinación de Aeriel para cumplir su misión.